Dendritic cell (DC)-based immunotherapy makes use of the DC's ability to direct the adaptive immune response toward activation or inhibition. DCs perform this immune orchestration in part by secretion of selected cytokines. The most potent anti-inflammatory cytokine interleukin-10 (IL-10) is under tight regulation, as it needs to be predominantly expressed during the resolution phase of the immune response. Currently it is not clear whether there is active suppression of IL-10 by DCs at the initial pro-inflammatory stage of the immune response. Previously, knockdown of the DC-specific transcription factor DC-SCRIPT has been demonstrated to mediate an extensive increase in IL-10 production upon encounter with pro-inflammatory immune stimuli. Here, we explored how DC-SCRIPT contributes to IL-10 suppression under pro-inflammatory conditions by applying chromatin immunoprecipitation sequencing analysis of DC-SCRIPT and the epigenetic marks H3K4me3 and H3K27ac in human DCs. The data showed binding of DC-SCRIPT to a GA-rich motif at H3K27ac-marked genomic enhancers that associated with genes encoding MAPK dual-specificity phosphatases (DUSPs). Functional studies revealed that upon knockdown of DC-SCRIPT, human DCs express much less DUSP4 and exhibit increased phosphorylation of the three major MAPKs (ERK, JNK, and p38). Enhanced ERK signaling in DC-SCRIPT-knockdown-DCs led to higher production of IL-10, which was reverted by rescuing DUSP4 expression. 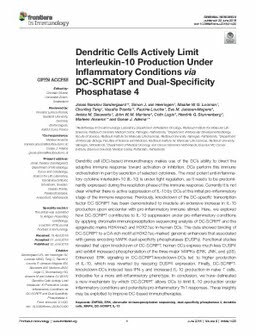 Finally, DC-SCRIPT-knockdown-DCs induced less IFN-γ and increased IL-10 production in naïve T cells, indicative for a more anti-inflammatory phenotype. In conclusion, we have delineated a new mechanism by which DC-SCRIPT allows DCs to limit IL-10 production under inflammatory conditions and potentiate pro-inflammatory Th1 responses. These insights may be exploited to improve DC-based immunotherapies.